Battleblock Theater, by The Behemoth. 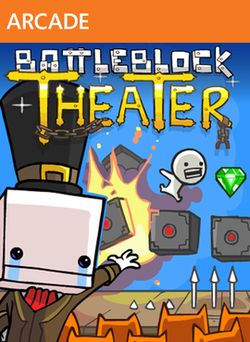 Battleblock Theater is currently free as part of Xbox Live Games With Gold until July 31, 2014. My recommendation: This is a hilarious, amazingly fun game. You definitely need to download it and try it out. Battleblock Theater is an insane, quirky platformer where you play cute little blockheads running through a series of platforming challenges for the entertainment of your crazy cat captors (yes, I planned that alliteration). It's tremendously fun, and it's definitely a unique experience. The bulk of the game is the campaign (which incorporates local and live co-op, if desired), but there are also several minigames and a level editor to keep the fun going. The narration and storyline are hilarious, and it's definitely worth your time to at least sit through the opening cinematic. It's really funny, and that narrator keeps the commentary going as you progress, giving a nearly endless supply of quirky comments, especially when you die. And when you find a secret area, he goes nuts. There's a whole special secret area song, and it's amazing. The controls are pretty easy, and the game does a good job easing you into lots of the more complicated maneuvers. It will slowly introduce different puzzles in the game that force you to utilize good teamwork and strategy. And those points also force you to find the right combination to use, such as a well place teammate toss. The game is relatively low stress because the vast majority of the levels are untimed, and there's never any penalty for dying (save for minor inconveniences like losing a bit of ground). There are "boss" type levels where you're racing against the clock to finish the level, and there are some extremely difficult bonus levels after each stage, but the main campaign is a great fun-filled way to relax. And with the cuteness of the characters and the bad guys, you can't not enjoy yourself. The game isn't without it's bugs. For example, if me and my partner die at the same time, we essentially spawn where the other just died. I can't find any rhyme or reason to where we spawn when one of us dies, but it seems to have nothing to do with the checkpoint flags we hit. I may be missing something, but either respawning is broken or it's way to random for me to discern any recognizable pattern. And some maneuvers and puzzles get really frustrating really fast. For the most part, lots of them only involve actually solving the puzzle, then the actual mechanical follow through isn't too bad. But for some of the challenges, the precise timing and coordination required is far too rigorous. Thankfully, the lack of penalty for dying helps offset the frustration, but trying to do the same maneuver 5 times in a row really wears you down. Then there were also some sections where picking up collectibles had to be done fast enough or it'd be impossible until you restart the level. Towards the beginning of the level, no big deal. At the very end, really frustrating. Not the worst thing in the world but it definitely sullied the experience a bit. I'd say if you like platformers or if you just like the laugh this is a fantastic game. It'd be worth full price, so picking it up when it's free is an amazing deal. I highly recommend it. Let me know what you think of Battleblock Theater!